Burks Fork Log Homes provides precision CNC milling in a fraction of the time and cost of conventional milling. We offer competitive rates and very flexible logistics. The Hundegger K2 is considered to be one of the best machines for Timber Framers, Log Home Builders, and Component Manufacturers throughout Europe and North America. 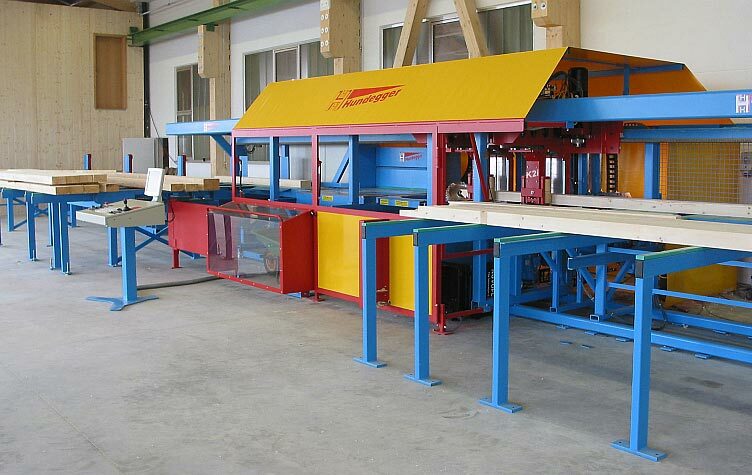 This fully automated saw and joinery machine can mill virtually any traditional timber frame connection, process traditional log home copes and notches, and cut any shape or size of truss or wall component without any setup. All this while optimally cutting the members to length with computer-controlled accuracy. The K2 is fully-customizable to fit your exact plan needs. CNC Controlled Milling for Various Log and Timber Applications. Supply Various Materials For Log and Timber Frame Homes. Burks Fork Log Homes wants to provide the highest quality milling, material, and service that we can. To ensure this we have set our tolerances much smaller than industry standard. Please note that every manufacturer has different standards and tolerances. Burks Fork Log Homes can and will modify our current standards to meet your individual needs and quality standards.